The Trump administration’s “zero tolerance” immigration policy is seen as unwanted and unfair in the border city of 142,000 that’s home to the massive U.S. Customs and Border Protection facility where families crossing the border illegally have been separated. 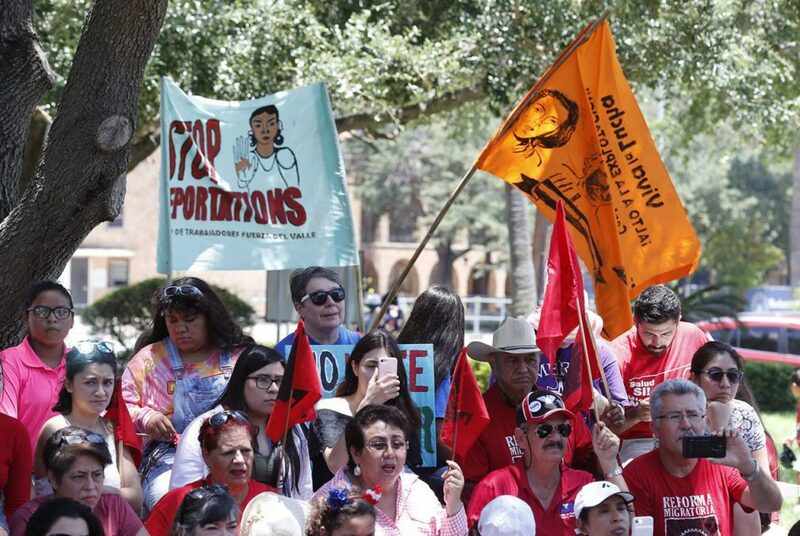 Protesters demonstrate against the Trump administration’s immigration policy in McAllen on Saturday, June 23, 2018. Maria’s Restaurant offers Pollo en Mole for $8.25 and patriotic red, white and blue peanut M&Ms for a quarter in a gumball machine near the front door. The menu in this family restaurant, about seven miles from the U.S.-Mexico border, is a reflection of the blended community it has served for 41 years. But now this town built on immigration has become ground zero for the nation’s nastiest political battle in the angry summer of 2018. “This is a border culture, so these people are not monsters to us,” said Carolina Garza, 31, a third-generation Mexican-American whose family runs Maria’s. She was talking about the masses of Central American immigrants flowing across the southern U.S. border by the thousands this summer seeking asylum, work and refuge from their violent homelands. McAllen is home to the massive U.S. Customs and Border Protection facility where families crossing the border illegally have been separated and children have been housed under the administration’s “zero tolerance” policy. The detention center for children is known as the “dog kennel” for its rooms made of chain-link fencing. The separations of about 2,400 children from their parents have sparked protests across the country and news coverage around the world. McAllen has suddenly become world-famous for something that it has no control over, which residents say is at odds with the city’s bicultural nature. Hundreds of activists, lawyers, protesters, religious leaders, journalists, a heavy presence of federal law enforcement officers and even National Guard troops have poured into this city and the rest of the Rio Grande Valley in recent weeks. The policy is seen as unwanted and unfair in this border city of 142,000 whose population is 90 percent Hispanic and so fully bilingual that roadside anti-littering signs say “No dumping basura” (trash). As McAllen prepared for its massive annual Fourth of July parade and fireworks display of patriotism, this city found itself feeling like a punching bag in the furious national immigration debate. Mayor Jim Darling, who keeps U.S., Mexican and Texas flags in his downtown office, said McAllen has suffered because of some of Trump’s statements and policies. Darling said that although McAllen is often portrayed as a “dusty border town,” it is a vibrant industrial hub closely linked to factories across the border in the much larger industrial city of Reynosa. He said McAllen spends more than $1 million annually recruiting businesses in Japan, Korea and other countries, mainly to invest in factories in Mexico. Many of the engineers, executives and other managers who work in those factories live in McAllen. He said McAllen has 18 million visitors a year, about 40 percent of whom come from Mexico. For decades, La Plaza Mall has been a destination for Mexican shoppers, who obtain a U.S. Border Crossing Card that allows them to cross into Texas as long as they stay within 25 miles of the border. McAllen raises more sales tax per capita than almost any other Texas city — about $60 million last year, greater than its property tax revenue, Darling said. And nearly a fifth of that comes from La Plaza. In recent years, that resource has been hurt by increasing violence in Mexico, the falling value of the Mexican peso and Trump’s anti-Mexican rhetoric. Trump so angered some Mexicans last year that they started an #AdiosMcAllen social media campaign urging Mexican shoppers to boycott McAllen. Darling traveled to Monterrey to reassure Mexicans that his city still welcomed them. He said the city spent about $300,000 on a marketing campaign called “Amigos Always” to counter the damage. “My face is still on billboards in Monterrey,” he said. Now the family separation issue is creating new image problems for McAllen. The city has been through similar strains in the past, including in 2014 when a flood of unaccompanied children from Central America ended up being processed in McAllen. But this time is the most intense anyone can remember. The Rio Grande Valley is the U.S. Border Patrol’s busiest sector, accounting for 40 percent of the apprehensions of illegal border-crossers along the entire 2,000-mile U.S.-Mexico border. Migrants use the valley as a gateway to cities across America, but few stay in McAllen. He said crime in the city is at a 33-year low, and there have been no murders this year. He said drug-related violence has increased in parts of Mexico, adding that it has not affected McAllen. But anger at Trump’s family separations was still raw in Archer Park, a grassy oasis in the middle of McAllen. At noon on Monday, in the shade of the gazebo where city workers were preparing for the July 4 celebration, a dozen people stood before a photo of Robert F. Kennedy and César Chávez. They were there as part of a fasting protest organized by Lupe, the civil rights group Chávez founded. “We’re about to celebrate our day of independence and freedom, and we keep incarcerating young children and people who have only come here looking for work,” said Marco Antonio Lopez, 31, who began his 24-hour fast on Monday. Lopez grew up here in the Rio Grande Valley, the son of immigrants, and became a citizen at 20. He said he’s never seen so much law enforcement in McAllen, and he said it feels alien and is upsetting to him. At Maria’s Restaurant, the breakfast crowd started rolling in when the doors opened at 7 a.m. Tuesday. Families with young children, older couples and office workers in crisp dress shirts sat at tables surrounded by walls painted vibrant yellow, orange, blue and green. Michael Mata, 44, and his wife, Adriana Mulato, 43, sat down to order breakfast in English and Spanish that blended as easily as scrambled eggs. “I’d like one egg, over hard, sin tortillas,” said Mata, a police officer in nearby Pharr. “Tienes bisquetes?” asked Mulato, a Mexico-born waitress who now lives with her husband in McAllen. Mata said his department trains officers in “customer service” and requires them to complete regular cultural diversity classes to keep their certification. He said he has breakfast almost every day with a friend, a retired doctor from Oklahoma, who is a big Trump supporter and wore his Make America Great Again hat to one of their meals last week. Across the dining room, a 76-year-old man sat reading a Spanish-language newspaper. “There’s a general feeling of tension and apprehension here because of the threats and the policies coming from Trump,” the man said. The man said he was a permanent legal resident and declined to give his name because he said he was afraid of repercussions from authorities. He said he had read stories about Border Patrol officers in other parts of the country questioning people simply because they were heard speaking Spanish.